New Rug, It Was Meant To Be. Did you notice my new rug in the recent post Curtains Hung And Unwanted Guest? before was this exact rug for $150. That’s a savings of $550 from Pottery Barn’s price!! The jute rug was only six months old and in excellent condition. Yipee! see more on choosing the right rug. I also bought a new rug from HomeGoods for the front door. Do you shop Craigslist? If yes, what has been your favorite find? I got my 4 poster cherry queen bed for $75.00 and the man delivered it to me for 5.00 gas money.. deal of the century lol..I also got a rattan and wood dresser with antique glass knobs for my daugters beachy bedroom- 35.00. can beat the prices plus I'm thrilled to get the items and the seller is thrilled to recoup some of their money. win/win for both of us. Lucky gal! It looks great there! I have never shopped Craigs List but probably should! Love your rug and you sure SCORED!!!!!!!!!!! Fabulous!!! Yay! I'm so happy for you! I haven't gotten up the nerve to try it yet (or had the time to keep checking back for what I want) but it's really starting to sound like I should! Lucky duck! What a BARGAIN – and that rug looks awesome. Best thing I ever got from CL was a gorgeous antique tea cart. I sold it a few years later for a trillion times more, too – it's really all about fixing things up and styling and providing good photos, eh? Very nice rug!!! What a find…I'm not that lucky with Craigslist. Actually I have never heard of a wool and jute rug. It seems like the wool would make the jute softer and more durable. Your room is gorgeous! 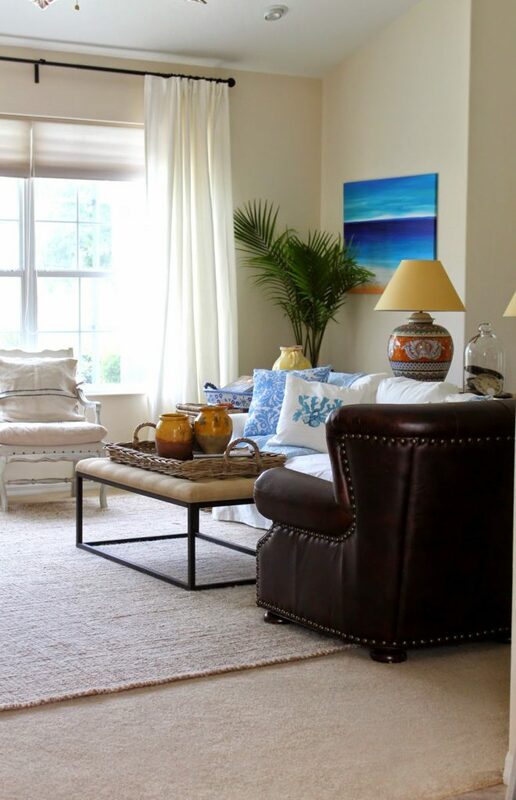 Sherry I love the way the jute rug looks in your living room…I love a layered look!! Great score too! Love the jute rug. I've had great luck on one for our sunroom on overstocked.com. Yours looks great! That was a lucky find! What a great savings. I have found good deals on rugs on Overstock.com too. I've never bought anything off Craigs List before but have tried selling on there. Wow! That is so exciting! Obviously it was meant to be 🙂 It looks lovely! Funny how there's a little voice in our head that tells us to move forward on something and turns out to be a great thing…so happy that you got such a phenomenal deal on CL…it looks so beautiful in the room…the perfect rug!!! Pretty rugs! My favorite Craigslist find is my vintage claw foot tub! Are you kidding me??? What a deal, it seems like I never find anything on Craigs list , but I know many people do! Fantastic!! I love when the planets line up and there's much singing and dancing. 😉 And great deals. I think I need to start looking for things on Craig's List. Your rug looks wonderful! Happy Day! Awesome score Sherry. What a gorgeous deal. Looks so pretty. 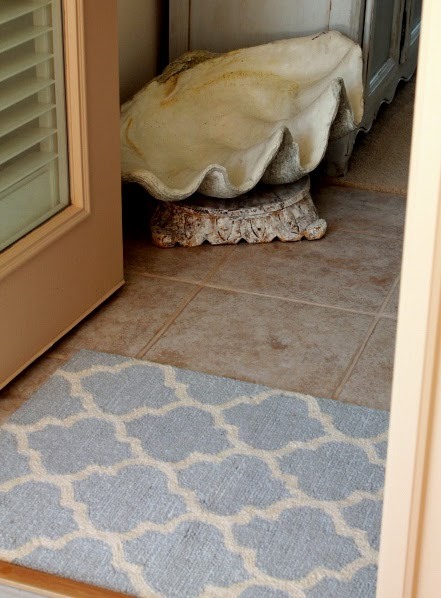 I love the blue and white front door rug from Home Goods too. So sweet. What an incredible find! Love the pics of your room! What a super find Sherry and what trmendous luck! I have never shopped Craig's List…I always seem to not think of it. I will definitely keep it in mind for further purchases. Very rarely do I shop Craig's but we do have a local "yardsale" site that I shop rom time to time. Love your newest treasure Sherry! What a great deal, Sherry! 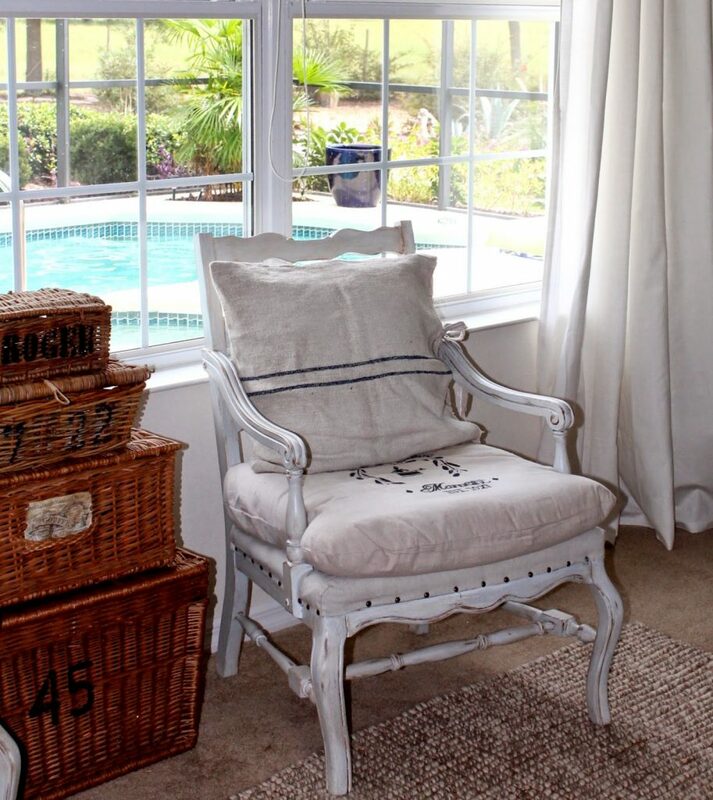 I love jute and your rug is gorgeous in your room! I have sold on Craig's List, but never shopped there. It sounds like I need to give it a try!